What is the difference between Honors and General Chemistry? Thank you for your interest in being a part of one of the best and largest clubs at John T. Hoggard High School. The Beta Club has been at Hoggard High School since 1991. It is an organization that is dedicated to academics and community service. Members are to show leadership qualities, outstanding achievement, and exemplary character. 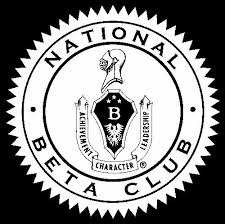 Beta Club members are chosen through an application process. The application process for this school year is over. Once students are notified of acceptance, an induction ceremony is held in October and students can start earning service hours. Please see the by-laws for more information. To receive a sash at graduation, a student will have to had earned over 50 hours of community service hours during their membership in Beta. Beta Club is a STUDENT club. Beta Club has a team of officers that are responsible for organizing sign up sheets, event processing, competitions and community outreach. Each officer has different responsibilities to help the club run smoothly. If you have anymore questions, please send an email to JTHBetaClub@gmail.com. New Members should sign up for Facebook and Remind once acceptance has been announced. Facebook: Members must request to be a member of the Facebook group. Many events/announcements are placed here. There will an announcement when new sign up sheets are posted to the bulletin board. Pictures from events will be posted here. Email: It is very important, that you check your email often. --Sign Up Genius emails will be sent for on-line sign up sheets. Remind: Students will be sent a text informing them of upcoming events. The amount of text on these messages are limited to only a few characters. so the announcement may be to check the Beta Bulletin board for updated opportunities to volunteer. Sign up Genius: You will receive an email about any events that you can sign up with sign up Genius. One of the biggest events for our Beta Club is the state convention in Greensboro. This convention is usually held at the beginning of February and we spend time during the school year preparing for the competitions. At the state convention, students compete in academic, art, music, banner, and scrapbook competitions. In the last two years of attendance, we have placed in several events: English, Math, History, Chemistry, Scrapbook, and Character Skit. If you are a community organization and need our help, please complete the following form. Community Help Request Form: Complete the following Google form, & email Mrs. Siddons for confirmation of event participation.--IF you have any questions please email Mrs. Siddons at chynthia.siddons@nhcs.net or contact the Beta Club email at JTHBetaClub@gmail.com and an officer will contact you. 2017-2018 Service Log: This must be filled out completely to get credit for service hours. Event are posted on the Beta Club bulletin board in the science building or through Sign UP Genius.